Winnette Butler Finishes the HPS List! Another day, another list finish? Earlier in the week, Dave Comerzan finished the list on Waterman. 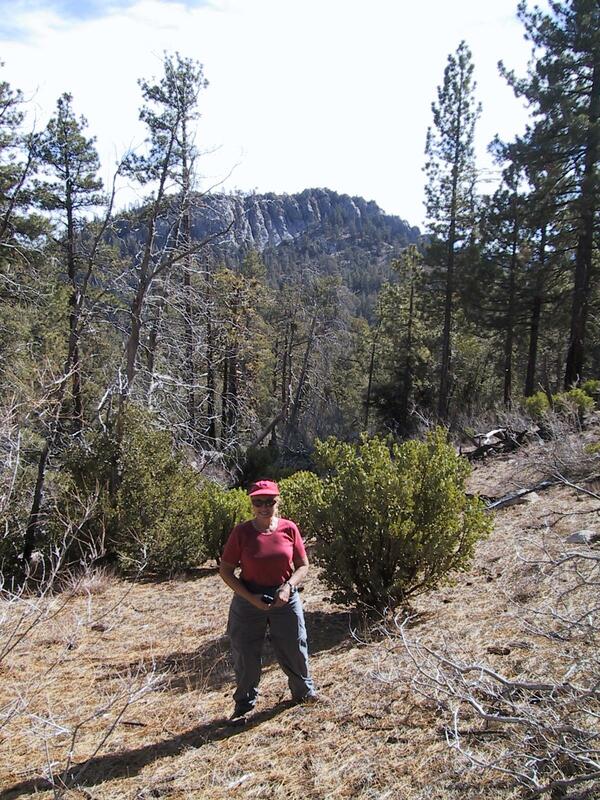 The day before, Pat Arredondo had triumphantly led a group to Kratka Ridge, her final peak. 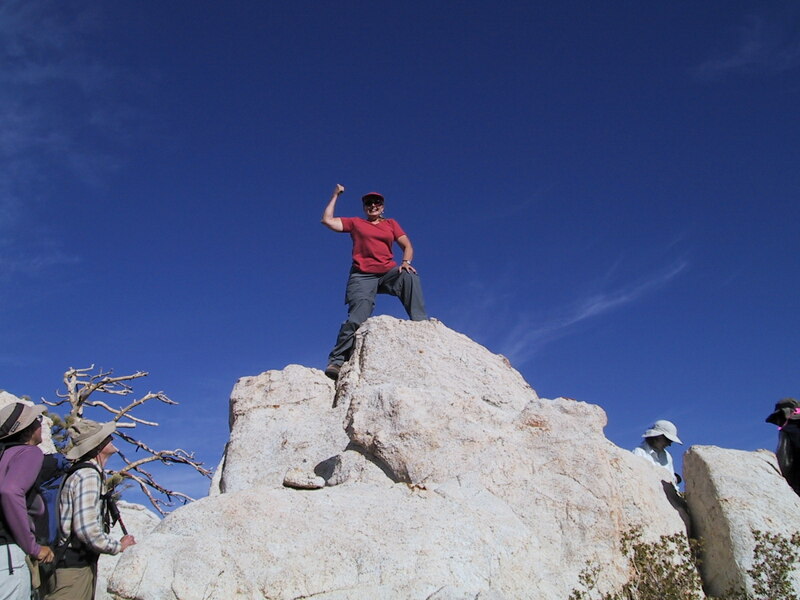 (If you want to see proof that she ascended the difficult summit block, be sure to visit http://www.mtpinos.com/pictures/ and see for yourself.) Even after eating all that food in honor of Pat's finishing the list, many of us somehow managed to meet the next day at the ranger station in Idyllwild. The destination: Sam Fink Peak. Although Winnette Butler had bagged 274 HPS peaks, plus assorted other SPS, DPS, and even Himalayan summits, somehow she'd never connected with Sam. The day had come. So ... if that wasn't Don and Mei in the unidentified car that had joined our caravan to Humber Park, who was it? We didn't recognize her, but when Susan Ellsworth asked if she could join our group and hike with us to Sam Fink, Winnette and Mars easily assented. 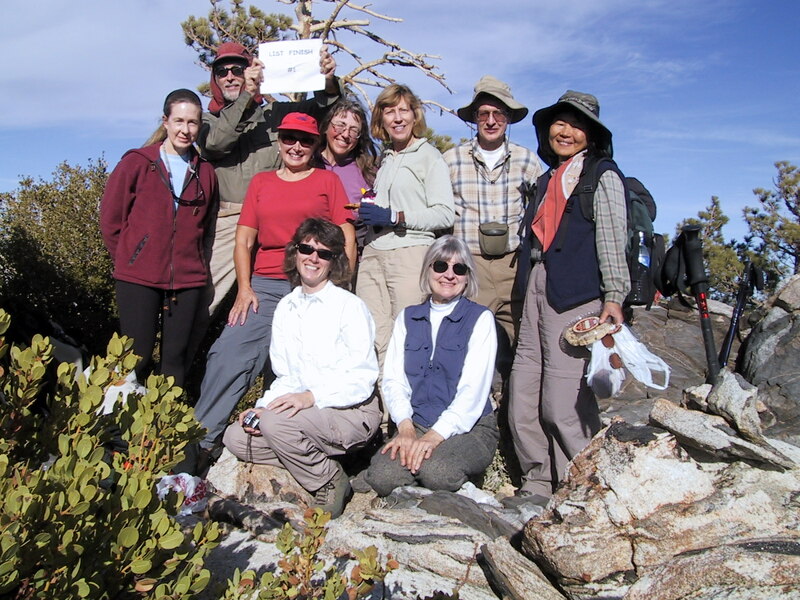 At the trailhead, then, there were ten of us: Winnette Butler, Mars Bonfire, Sandy Burnside, Kathy Cheever, Dorothy Danziger, Susan Ellsworth, Mei Kwan, Karen Leverich, Wolf Leverich, and Don Tidwell. Luckily, we weren't using the Tahquitz Peak guide, in which it currently says it is 22 miles from the trailhead to Saddle Junction. We were brilliantly using the Sam Fink guide instead. (For some reason, Winnette was quite determined we go to Sam Fink, and not to any of the other lovely peaks thereabouts. What happened to democracy?) 2.5 miles up Devils Slide are more than enough for me, although they're a perfectly lovely 2.5 miles, with fabulous views of Suicide and Lily Rocks, and Strawberry Valley. And much more pleasant on a cool November day than my last visit during summer. Once at Saddle Junction, there are options. Lots of options. Too many options? Not if you're hiking with Winnette, who (as I mentioned above) wasn't at all tantalized by the possibility of visiting Tahquitz Peak. But there were still two options: we could follow the trail to Laws Junction, or we could go towards Skunk Cabbage Meadow and then take a cross-country shortcut to reach Laws. That route passes through this wonderful meadow of ferns. In the past summers, I've seen this sea of green ferns, dappled by sunlight, stirred gently by a breeze. It's quite breathtaking. Even after a dry summer, though, it's still a very special sight. Instead of the magical leafy green sea of my memory, we passed through acres and acres of autumn-touched golden ferns. Speaking of magic, the first time I visited Sam Fink, Carleton Shay was the leader, and he took us cross-country directly to Laws Junction. A truly incredible internal compass that man has! The second time, I was following Mars. He didn't think he could flawlessly emulate Carleton, so deliberately aimed a bit to the right of Laws. When we emerged on the trail, we turned left, went a brief distance, and voila!, we were at Laws. Serious Paragraph. Mars asked me, if I did a trip report on Winnette's list finish, to describe the following seriously. OK. Although I kind of doubt that we'd've ended up at the tram, even if ... But anyhow, on this visit to Sam Fink, Mars was again aiming to hit the trail to the right of Laws, planning as before to then turn left. When we reached the trail, though, we hesitated before turning left: something didn't feel right. Don, map in hand, thought we'd come out to the left of Laws instead of to the right. If we turned left and hiked, we'd not come to Laws, we'd instead eventually come to the Palm Springs tram. Looking a bit perplexed, Mars took off to the right on the trail, hoping to sort out the dilemma. Ah ha! Laws was to the right, not left. Don and the map were correct. The serious message of this serious paragraph: no matter how good you are (and Mars is one of the best wilderness navigators I know), always be willing to question assumptions and research the situation. Seriously, I doubt we could have convinced Winnette that they'd built a tram station at Sam Fink Peak after the peak guide had been written. There's a watercourse at Laws that I've never ever seen any water in. This day was no exception. But against the day of the great flood, someone had installed a large and beautiful wooden bridge across it. So after stashing water, we headed across the bridge and prepared to go down to our next destination: Caramba Camp. The team was getting rowdy. All hike and no play doesn't sound so bad in abstract, but there were these invitingly lovely pine cones strewn on the trail. Those of us at the front of the column were soon distressed (amused?) to hear giggling and shouting behind us, and the occasional pine cone zinging off our backsides. Soccer? Football? Something about this trail seems to suggest athletics -- when I did the hike earlier this summer, Janet Howell attempted to explain the rules of baseball to Ingeborg Prochazka on this same stretch of trail. If you didn't learn the game when you were knee-high to a grasshopper, baseball is a VERY strange game. Trust me! Hmmmm, how were we going to get over those cliffs? Well, of course, these things usually work out, even if they're sometimes a bit of work. To get to Sam Fink, you proceed on the trail to Caramba. Then cross another dry watercourse (no spiffy new bridge this time). Then up a steep slope until a ducked use trail is encountered. Then around the ridge to a saddle, and a final scramble up a steep rocky slope to the peak. That's the plan, anyhow. The problem was that someone (we decided it had to have been Byron, always the scapegoat of choice?) had been there before us and installed some siren ducks, which lured us to the left at a lower elevation than the use trail we sought. Hardly a disaster, but definitely annoying when we eventually got suspicious and had to work our way steeply up up up to finally acquire the use trail. From there, though, it was short work to the saddle, and then to the peak. It says, "LIST FINISH #1." Mmmmhmmmm. For Joe: standing, left to right, are Susan Ellsworth, Mars Bonfire, Winnette Butler, Karen Leverich, Sandy Burnside, Don Tidwell, and Mei Kwan. In front are Kathy Cheever and Dorothy Danziger. Photographer is Brian "Wolf" Leverich. I knew from Pat Arredondo's list finish the day before that there would be food and more food. Not wanting to get stuck carrying my offering back up the trail from Caramba to Laws, I quickly got my cookies out and had them handed out and the bag empty before anyone else could do the same. Heh! So of course we ate and hugged and admired the views (one can see half the list from Sam Fink, I'd swear -- not only the Desert Divide, but Martinez, Rabbit, the newly relisted Toro...). Sam Fink, especially on a cool day (I have been known to compare it to a solar oven on an earlier visit) is a perfect peak. Well, it may be perfect, but it is a long way back to the cars, with a lot of uphill along the way. And it was already mid-afternoon. Winnette had promised to buy us dinner (another fine tradition -- future list finishers please take note! ), so we were soon fantasizing about enchiladas and tamales and chile rellenos. What we weren't doing very soon was actually eating any of these goodies. Sometime after Laws and before Saddle Junction, it got dark. Most of us stopped to don our headlamps. Don opted to hike ahead alone so our lights wouldn't spoil his night vision. We about jumped out of our collective skins when, further down the trail in pitch darkness, he leapt out from behind a tree making spooky noises. C'mon, Don, Halloween was last month! Going down Devils Slide, we broke into a "fast" group and a "slow" group. I use quotation marks because I don't think any of us were being especially speedy by then. As a member of the slow group, I did note that the fast headlamps were seldom more than a switchback or so ahead of us. Back at the cars, we indulged ourselves in champagne (some of which was pretty cranky about being opened) and generally milled around until wiser heads (Sandy and Brian, maybe?) pointed out that if we wanted to fulfill our cholesterol-laden fantasies, we'd better get to the restaurant before it closed, an event that was probably going to happen Very Soon Now. That got our attention, for sure! We descended on the Mexican place across the street from the ranger station, ate, drank, and were merry. Way to go, Winnette! Now, who's next, and more importantly, where do we eat?